Over in London’s square mile today people were reportedly waiting for three hours in the pouring rain to go up the landmark ‘Gherkin’ building. “Not worth it for six minutes at the top,” someone wrote on Twitter. Officially 30 St Mary Axe, the 41 storey construction, completed in 2003, is certainly impressive. But it’s not the only place in the capital where you can get spectacular panoramic views as I found by exploring the World’s End council estate, sandwiched between the Thames and King’s Road in west London, this afternoon. Nineteen storeys up, and at the very top of one of these residential towers, I could see for miles, in spite of the bad weather. The Thames, the City and beyond were all visible. And all without queing in the rsain. Jules and Margaret, one a former resident and the other still living there, were showing me and others around the World’s End estate this afternoon as part of Open House London. 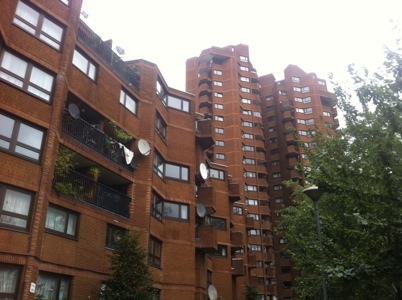 Built between 1968 and 1977 to replace low rise Victorian terraced housing, the development consists of seven high rise blocks and a number of low rise properties connected by covered walkways, so called ‘streets in the sky’. 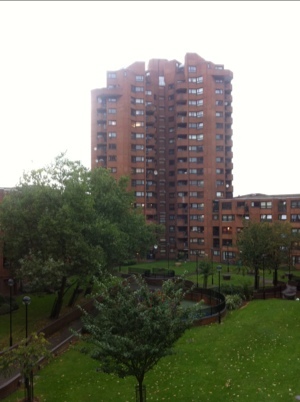 It is essentially one building, in a figure of eight shape, with landscaped communal gardens in the middle. But while council estates are often in the news for the wrong reasons, Jules painted a different picture of life of World’s End. Low levels of crime, allotments, playgrounds and a thriving community centre / theatre complex. The exterior of the flats, clad in red brick, certainly looks attractive. World’s End accommodates the same number of people (in 750 units) to the terraces it replaced, but thanks to building up residents have many additional facilities like a school and a number of shops facing onto the King’s Road. When the estate first opened every unit even had an underground parking space, although part of this garage space is now leased to a self storage company as many people don’t have cars. While some properties have been sold off as part of the right to buy scheme, the majority of residents remain council tenants. For £160 per week for a two bedroom property who could blame them? – you would struggle to get a mortgage in such a nice area for that. And with some of flats overlooking the Thames, you can see why many residents see it as one of the best places to live in London. 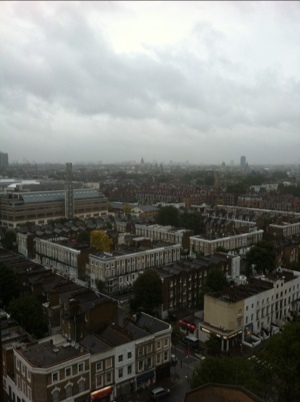 They certainly wouldn’t have had to wait in queues in the pouring rain in central London for panoramic views today.